Why won’t my key work in the ignition? Cars wear out, and different parts of them wear out at different rates. The ignition cylinder is no exception. The cylinder itself can wear out, as well as the wafers inside the lock. Due to this wear, your key will no longer be able to move the wafers inside the cylinder to the correct height. As far as your ignition is concerned, you are no inserting the right key. Even though this is the key that has always worked with the car, the cylinder is too damaged to work properly with the key that had worked fine. When this is found to be the case, you will need to undergo ignition cylinder replacement. Can a locksmith replace my ignition cylinder? Yes. The ignition cylinder of a car is just like a lock. Similar to a pin tumbler lock, it has internal mechanisms that must be properly moved in order to turn. It also has a sequence of steps that allow the cylinder to be removed. To an experienced locksmith, there is no real difference between this type of lock and any other. Sure it requires a bit of extra know-how and some specialty tools, but that is standard fare in the world of locksmithing. When you contact United Locksmith, we will send a trained auto locksmith who is prepared with the proper tools and experience. When it comes to ignition cylinder replacement, go with the company who knows everything there is to know about locks. How long does it take to replace an ignition cylinder? Ignition cylinder replacement will take approximately 20 minutes to complete. This timeframe will shift depending on the exact make and model of a car. For instance, this process might take longer when working on classic cars. Other than that, the time required may increase if there are further services required or more serious complications than anticipated. If the situation does call for more severe servicing, chances are the United Locksmith can help. As long as there is a problem with your locks, you can count on the best locksmith around to help. All of this work can be done at your location thanks to our mobile locksmith technicians. This saves you time on traveling and towing. When your car is not working properly, you do not want to be driving it all around. Can I just get my ignition cylinder repaired? There are instances where an ignition cylinder can be repaired, but this will not be the case every time. When there is too much damage or wear to the cylinder, new wafers will not be able to function properly. In some situations, the damaged cylinder may be wearing down, or breaking the wafers, and it will be in your best interest to fix the problem by replacing the main malfunctioning piece. If the cylinder can be repaired, then your locksmith will deliver that service. It is only in the most extreme circumstances that you will need an ignition cylinder replacement. Some people will choose to simply get a complete ignition cylinder replacement because they are worried about the issue happening again. That decision will be up to you. How do I know I need to replace my ignition cylinder? Car troubles can be pretty deceptive, but there is always a way to figure out the problem. You begin by realizing for yourself that there is an issue with your car. If the problem centers on your use of the key, then this should point you in the direction of a good locksmith. When you find a professional locksmith that can give you top quality service, getting a diagnosis is simple. The locksmith can arrive at your location and conduct their servicing there, that way you do not need to worry about traveling in a car with a faulty ignition. The technician will troubleshoot the car while looking for the telltale signs of a faulty ignition cylinder. If you need to have an ignition cylinder replacement, the locksmith will be able to deliver that service at your location as well. In the instance where you are requiring a diagnosis, a separate appointment may need to be made so that the proper parts can be acquired. Can the locksmith come to me? Yes. The beauty of choosing to have a locksmith help you with your ignition cylinder replacement is that they can offer mobile appointments as well as emergency services. Either a 24 Hour emergency locksmith or an auto locksmith will be able to assist you. United Locksmith’s arrival times average between 20 to 30 minutes in the case of an emergency call. We can be there with the proper tools and the knowledge to get the work done without harming the car at all. If you are looking to make an appointment, those can be scheduled for whatever time is most convenient for you. We offer 24-hour services, so we always have a technician on hand to deliver top quality services, wherever and whenever they are needed. Should I use a locksmith to change my ignition cylinder? Because you are requesting a service that has to do with auto-parts there are several ways you could approach getting your service done. The best way is to contact a locksmith. The reason is that they understand locks. They are not just going to give you the new part without finding out what was wrong. They will also try to fix the cylinder itself. If it is possible, you will have that option as well. Besides being the most knowledgeable on this subject, a mobile locksmith service can also come straight to your location. When you have an issue with your car, not having to drive it around, can be quite helpful. With a job like ignition cylinder replacement, convenience and experience are required. There is only one place that you should turn for your ignition cylinder replacement, and that is United Locksmith. We have the tools needed to get the job done, and the experience to assure that it is done right. There is no need to fret when you put your faith in the best locksmith under the sun. Our locksmiths will arrive on time and can deliver emergency assistance if your problem ever catches you unaware. Once your locksmith has determined that your car requires ignition cylinder replacement, they will give you the estimated time required for the job as well as the exact cost of the service. All that is required from you is the desire to continue with the process, and a bit of your time as the service is conducted. When the ignition cylinder replacement begins, all replacement parts will have been secured. There is no reason to begin the process without having all of the necessary replacement parts. Ignition cylinder replacement always begins with disconnecting the negative terminal on the car battery. This helps the technician and the vehicle. It lowers the chance of electrical shock, and it also keeps the car from starting and turning on as the key is manipulated. After this step is completed, the ignition needs to be made accessible. This will require the plastic covers to be removed from the steering column. Doing this requires some standard tools and some car-specific knowledge. Most steering column covers have a mixture of screws, bolts, and plastic latches. The screws and bolts are relatively straightforward. They require a tool that can fit the head of the fastener. This can sometimes require special tamper proof bits if the car uses tamper proof screws. The plastic latches are where most of the effort is placed. To disconnect these latches there is a dance between rough shaking and finesse. Without the proper knowledge, it is very easy to damage these latches. Sometimes it is only going to feel as though the latches are breaking when that is the way they must be removed. Other times that feeling will actually be the latches breaking. Besides the latches, certain handles and accessories many need to be removed so that covers or screws can be accessed. Without knowing exactly what needs to come off, and in what order, this part of the process can take a while. This is one of the key reasons you should hire a professional locksmith to conduct your ignition cylinder replacement. Once all of the steering column covers have been removed, it is now possible to access the ignition cylinder. There may be some more bolts on the cylinder, which will need to be removed. These may require tamper proof bits or have a standard head. When all bolts and screws have been taken out of the cylinder it is time to depress the pushpins. The pushpins will be found in different locations, depending on the make and model of the vehicle. They are recognizable as holes in the metal that will fit a small Allen key or similar thin probe tool. There may be two pushpins in some cases. Those will require more patience as one side can re-engage as you are working on the other. Depending on the cylinder, the key will need to be moved into a specific position. Sometimes this is the “ACC” position or the “ON” position. This can be difficult if your key will not manipulate the wafers and turn correctly. If your lock is retaining the key, or not moving with the proper key, it is best to call a locksmith. With the key turned to the proper position in the cylinder, all push pins depressed, and all fastening screws removed, the cylinder can be removed from the ignition. With the ignition cylinder out of the car, the lock can be decoded in the event that you would like the new ignition cylinder to fit the old key. United locksmith offers this type of ignition rekeying service so that you do not need to have two sets of keys for one car. (One for the exterior locks and one for the ignition.) When you are installing the ignition cylinder replacement, there may be some further steps required, depending on the type of car. Sometimes there is a spring-loaded trigger that must be depressed in order to install the ignition cylinder replacement. The new ignition cylinder is checked to make sure it is being installed properly. That means that the key has been moved to the position that the old cylinder was oriented to in order to be removed (ACC, ON, etc.). Before the steering column is refitted, the battery is restored to working order so that the assembly can be tested. The battery should be unplugged again so that the paneling can be put back together. Then the job is finished and the car can be returned to working order. Knowing the positions that your key can be moved to will help with the diagnoses of the issue. It will also give you more information to relay to your locksmith technician, so they can be better prepared for your particular ignition cylinder replacement. Similarly, this information may lead you to realize that you need another service along with or instead of ignition cylinder replacement. In any case, it is good information to know. OFF/LOCK – When you remove or insert your key, the ignition must be in the “OFF” position. This is also referred to as the “LOCK” position. It should be the only position that the key can be removed from. In the other orientations, the key is locked into place. The feature provides the safety of making sure that a person does not have their keys removed while driving. If the keys were to be removed will you are driving, the steering wheel would lock up, and the car might stall. If your key is not being retained in the other positions, then there is an issue with your cylinder. You will need some type of inspection, which may result in an ignition cylinder replacement. 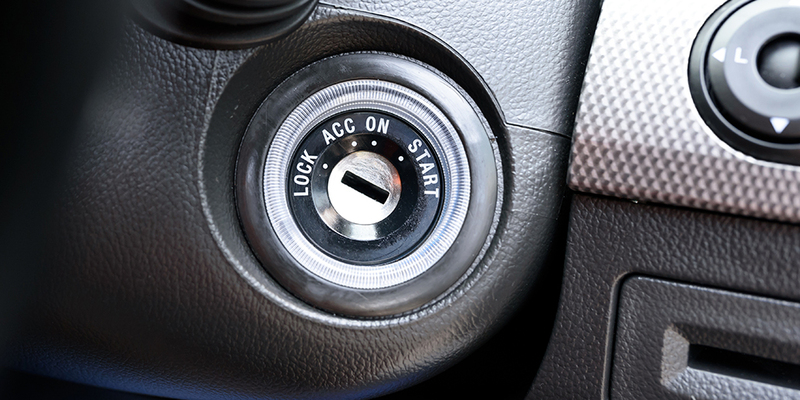 ACC – The accessory position on your ignition allows you to use some of your electronics, but not all of them. Most often, at the very least, the radio will work. Sometimes power windows and air conditioning will also work from this position, but if not, the car will need to be moved to “ON” for these electronic capabilities. The key should also be locked into the ignition. There should not be a way to remove it, without first returning the key to the off position. ON – When the key is moved to the “ON” position all of the electronics will run. Anything that could not be used during the “ACC” position will now work. There will be no way to remove the key from this position in the ignition. After the engine has cranked and turned over, this will be the position that the key returns to. In manual transmission cars, the vehicle can be “On” without the ability to turn over if the clutch is not depressed. START – The “START” position is used to crank the engine of the vehicle. After the engine starts, the key should be released so that it can return to the “ON” position. The key should absolutely not be able to be removed from the ignition in this position. It is also important that the key does not remain in the “Start” position as prolonged stress on the starter after the car is running can damage the vehicle. Now that you know how your ignition should be working in all of the different positions, you will better be able to tell if the ignition cylinder is not properly retaining or releasing the key. Any removal or insertion issues are often a clear sign of a need for ignition cylinder replacement. This means that there is some sort of trouble with the wafers. Those wafer issues may be indicative of a failure in the cylinder itself, which will mean that the entire cylinder needs to be replaced. If the electronics are not turning on at the right times, then there may be a problem with the internal mechanisms of your cylinder. The car may also not be starting. This is a very general issue, and may be an indication of a great many things, but it could also be the result of a faulty ignition cylinder. If you would like some help in finding out if the problem is indeed the cylinder, you can schedule an assessment with our locksmith. If the issue is something lock related we will be able to assist you.